While developing a library in .Net which could be used by another programming language than it was originally designed in, it is important to remember that the .Net Languages offers a subset of CLR/CTS while offering a superset of CLS. And, if you want to develop a library that could be used by any programming language supported by .Net, you have additional responsibility to ensure that your code doesn’t take of care of any features outside the CLS. Thankfully, .Net provides us an easier way to check the same using the CLSCompliant Attribute. The above code would raise warning “Warning CS3005 Identifier ‘TestClass.method1()’ differing only in case is not CLS-compliant” to help us identify the non-compliance. Do note that mEthod1 doesn’t raise a warning as it is a private method and is not exposed outside the assembly. Posted on April 23, 2018 April 23, 2018 by Anu ViswanPosted in C#Tagged .Net, CLS. Anyone working on .Net application with MySql 5.7 and EF in Db First Approach would have come across what is an officially confirmed bug. This bug rises when you attempt to generate/update your Entity Model after changes to the Database. Open your Workbench and execute following commands on your Db. Close your workbench ( you might have to restart your visual studio as well ). Parse Sub-Folders which do not contain specified file extension. An easier way to parse for folders, which do not contain files with a specified extension. CA2200 : Rethrow to preserve stack details. That’s one recommendation that as a developer you might have seen when running Code Analysis on your solution. So what does it mean ? What does the guilty code looks like and what is the correct way to throw exceptions. Lets start with incorrect code first. We have 3 classes, the main class which invokes a method of IntermediateClass, which in turns invokes method from ErrorClass. The ErrorMethod has been designed purposely to throw an error. It doesn’t implement an exception handling mechanism of its own, and the exception is caught by the Intermediate Class. The Intermediate Class, in turns, throws the exception back to the main class. The Code Analysis Tool has problem with this very same line, where the Intermediate Class throws the exception. Every Exception Object contains a property called Stack Trace, which carries a list of method call hierarchy starting from the method which threw the exception to the method which caught the exception. If you were to analysis the stack trace of the exception caught in the Main Class, you would find something in similar lines. As you can observe, the stack trace doesn’t contains the references to the ErrorMethod, but rather it is reset and traces method starting from the point the exception is rethrown, that is from the intermediate method. In order to preserve the stack information, when you need to rethrow the exception without specifying the exception explicitly. Following would be the modification that would be required in Intermediate Method. Now if you were to view the stack trace now, the method list would look slightly different. So next time you rethrow an exception, don’t forget to ensure the exception is not explicitly specified. Now that we have our Factory Object ready, it is time to inject it into our Repository Class. I prefer to use Constructor Injection for the purpose. Now we are all set to Mock our CustomDbCommand Object, or in other words, our IDispossible object. Happy Unit Testing. 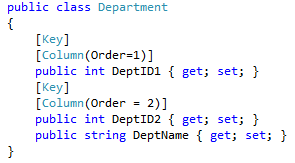 When developing domain classes in Entity Framework using Code First Approach, the default code conventions creates a primary key of a property named “ID” or <ClassName>ID. But if you wanted to use another property as your primary key , you can use DataAnnotations and decorate the property using “Key” attribute. What is more interesting is that you could actually create a composite primary key. All you need to do is use another attribute along with “Key”, namely, “Column”. The above example creates a Table with a Composite Primary Key made up of Dept1 and Dept2. Entity Framework is surely letting the developers live in the comfort zone of Visual Studio rather than dig up SQL Server. Again one of those things which looks so simple, but could drive one mad during debugging. Much before Optional Parameters came in, C# developers used to depend on Method Overloading for mimicking Optional Parameters. Consider a scenario where both exists, what would be the output ? The reason behind this is the overload resolution method adopted when we have a overloaded method and a method with optional parameter. Here is what MSDN says.